Over the last decade, Chandler has shown a huge increase in home purchases and therefore, a great need for termite inspections and reports to finalize those home sales. The last thing you want when you make the huge investment to buy a home is to deal with termite infestation and the costs that go with it! That is why we want to explain the different types of termite treatments so that you know what options you have if you ever suspect a termite problem or want to put safeguards in place to avoid dealing with termite issues in your home. Are There Preventative Termite Treatments? Luckily, yes! 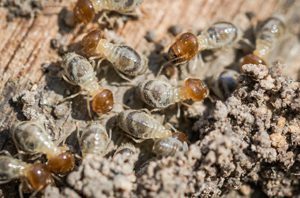 There are termite treatments that can create ‘a barrier’ around your home to help prevent termites from entering the structure and they are categorized as two types: liquid termiticides and termite baits. These termite treatments are applied to the soil around your home using specialized equipment to drill into the soil, the foundation or the walls depending on the potential risk you have for termites. A professional would be able to determine your termite risk by inspecting your home and evaluating potential areas that are problematic to help you decide if a preventative termite treatment is best for you. The liquid termiticides usually have fast results since they create a chemical barrier in the soil that kills termites that enter the treated soil. These treatments can last about 5 years and any reputable pest control company will offer certain guarantees based on your pest control agreement. This means the pest control technician will return at no cost to you if there are any termite issues within a certain amount of time from when the liquid termite treatment is laid down. They way bait systems work to kill termites are by placing plastic bait stations into the ground around the home that contain fibrous wood substances that when consumed by termites will kill them. So the hope is they take the ‘food’ back to their nest and it will kill whichever termites eat the substance! Bait stations may take longer to work but can last longer than 5 years. They are also a good way to track termite activity where there is not yet a problem to see if termites are in the area and complete a perimeter treatment as termite prevention. What is the Best Termite Treatment for Active Infestation? The answer to this question depends on a few factors. One, the type of termite that has infested your Chandler home; two, the extent of the infestation and three, if any termite treatment has already been performed. Treating for termites is a complex issue because you are dealing with living, moving organisms. To help determine what type of termite you are dealing with it is best to have a professional complete an inspection of your home, specifically any area where you see signs of termites. The classic ‘mud tubes’ are signs that you have subterranean termites which require contact with moisture in the soil to survive. In this case, either a liquid termiticide or bait station drilled into the soil could help treat the issue. Drywood termites on the other hand leave very little sign that they are present so in this case, bait stations may work at any point where your pest management technician recognizes weakened wood or tiny pinholes. If the infestation seems widespread, using both types of treatments may get you the best results. Of course, if a liquid termiticide doesn’t treat the termite problem or cannot be used due to a nearby body of water or a water table underground, then bait stations will be the way to go. We truly hope you never have to deal with termites but in Arizona, it’s almost inevitable. The good news in all of this, termite infestations are treatable with professional grade treatments and equipment but the bad news is they can still do damage before you even realize you have termites. We are always here to help answer any questions since termites are our specialty so please call us so that we can take care of your termite issue as quickly as possible!